A welcoming 2,534 square feet of living space, nestled in one of Lido Isle’s tree-lined stradas, is what you will find on 105 Via Undine. This 3 bedroom, 3-bathroom home, with an office and 2 patios, has the charm of a bungalow and the quality and style of contemporary living. 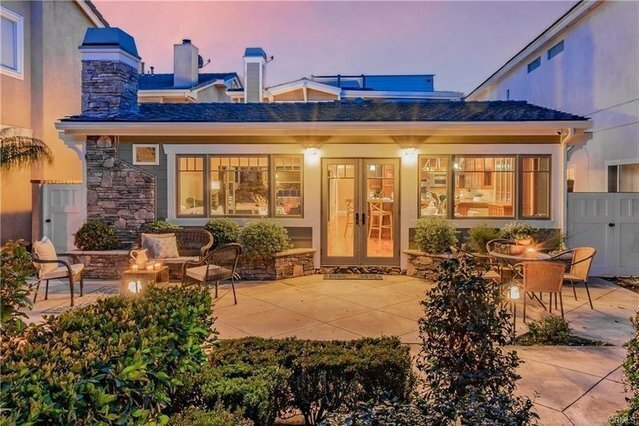 Recently rebuilt and remodeled, this home has stylized custom lighting from the designer of The Grand California Hotel at Disneyland! The kitchen features premium appliances, a lavish island for entertaining, and a built-in refrigerator. You and your guests will feel welcomed as you walk into this spacious home and head through the bi-fold doors out onto the private outdoor patio featuring a built-in BBQ, fireplace, and a custom tiled fountain.